We have two boisterous boys that need a new home. They are most fantastic little pugs but given their early life they are anxious pugs if they feel they are having to compete for your attention. However, when they are on their own they are great and quite happy to meet other dogs and socialise with people, they are just not good when sharing you with other pets. Doug is the most active and he looks for a high place to sleep like a table to feel safe, though he is a lot better now and will sleep in his bed. Pokey is very sweet just nervous when he meets people or other dogs for the first time, given we have 9 dogs and people come and go all the time the last two months he has improved greatly so I don’t think this trait is permanent. Need to have someone at home all the time as they do get separation distress. I am looking to re-home a small breed dog & I have a friend with 3 pugs so i have had some experience with this breed. I have 2pugs in need of forever home please call me for details. I’m interested in adopting a puppy pug. I have a lovely home and he would have everything he needs. I had a puppy as a child and I’m used to grow next to one. If any available please let me know. Hello I’m a mother to 4 pugs,and still have plenty of space in my life for as many as my house would hold. I obviously would provide any pug the best possible treatment love and give them the best life they would deserve. I would loved to be involved in anyway possible. 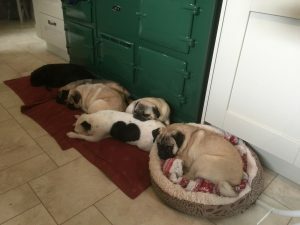 Hi, we are looking at re-homing a young pug, we have two dogs at this moment in time , a Yorkie and a Begone freeze, my wife works part time and my eldest daughter works lates so somebody is home all the time, we have a large park within 800 yards of home, where our dogs play happily,its safe and away from any roads. Our dogs are covered with pet insurance and are loved dearly, we wish to offer a pug a part of our lives..
Are you still looking to rehome your pug baby. I lost my pug 12 months ago and for all I said I’d never have another dog due to the upset I’m now ready to love again!! Having already had a pug I’m very well aware of how much time and love they need and deserve. If you are still looking you can email me on the above email address. Please could I re home one of these lovable pugs my girlfriend is absolutely in love with pugs and I thing they would make a great addition to our family ? Hi me and my family are looking to rehome a young pug we have a cockerspanial big garden and 4 children aged 4 to 14 preferably looking for a male pug thanks. Myself and my two children are looking to rehome a dog or dogs that is very friendly. Am at home all day everyday. We have a big house with a big garden and we love nothing more than cuddles. Could we have some more information on the Dogs please. I don’t have cats or other dogs either. I love Pugs and always have and would love to regime these for you. I live in the Lake District so there’s plenty of open spaces to take them to have a run around plus there’s plenty of open land near my home too. Where are they currently living? I’ve been looking for a gift to my wife and two kids and they always say that they would love to have a pug to be an addition to our family and i cannot afford to buy one. So it would be a great honor and gift to have one. Have you re homes these two yet? Do they have to go as a pair or could you take one? Please let me know some more details. I am currently looking for a young Pug and would far rather rescue/adopt a dog in need of a home. I work from my home office so am here 24/7. I have a secure rear garden and plenty of experience with dogs and ongoing training requirements. Let me know asap as I am looking to rehome by the end of the month. I would love to offer a good, loving home to these 2 little boys. I am a retired lady who is home all day, I live in Tavistock, Devon. I live alone, in a bungalow, with a good size patio / garden. I have to ask HOW MUCH DO THESE BABIES DISLIKE CATS. I have 1 elderly Cat, she will be 14 next month and although she was brought up with 2 dogs, I am not sure how she will react initially. I have a 3 year old female pug looking for some friends I have a loving home waiting .. I am a stay at home mum during the day and work evenings when my husband is home so they would never be alone.